December 1st is the 170th birthday of William Henry Holmes, the Smithsonian’s own Renaissance man. Early in the Smithsonian’s history, Holmes served as the head of the Anthropology Department and later the first director of what would become the Smithsonian American Art Museum. Starting today, we’re celebrating his legacy. 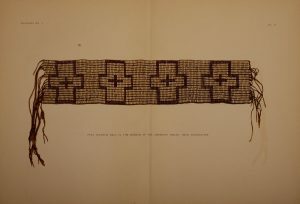 “Penn wampum belt” from The Penn wampum belts (1925). November is Native American Heritage Month. 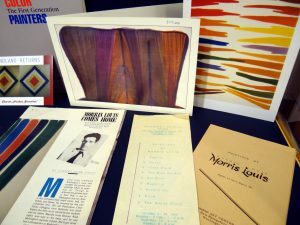 The Smithsonian Libraries has many intriguing resources about Native American history, especially in the Vine Deloria, Jr. Library, National Museum of the American Indian. I was recently reminded of this as I came across The Penn Wampum Belts by Frank Gouldsmith Speck (1925). The big Thanksgiving meal is fast approaching and for many that means a well-dressed table, perhaps with heirloom china. What would your dinner table have looked like for a nice meal or tea over a hundred years ago, maybe back when Great-great Aunt Agnes first started filling her china cabinet? The Trade Literature Collection includes catalogs illustrating dinnerware, glassware, cutlery, and cooking utensils which can give us a glimpse into the past. One of these catalogs is from the Fall and Winter seasons of 1899-1900. In conjunction with the exhibition “Hard-edged, Bright Color: The Washington Color School” at the American Art and Portrait Gallery (AA/PG) Library, the blog will be exploring the group of color artists to accompany the exhibit running until late spring. We’ll be exploring three of the “first generation” Washington Color School artists: Morris Louis, Kenneth Noland, and Gene Davis. You can read the first post in this series here. The 1950s and 1960s saw the emergence of a new ‘School’ in the American capital, the Washington Color School. Experimenting with fields of bright colors achieved by applying thinned paint onto large canvases, these artists sought to enrapture a viewer without the use of narrative or symbolism.